The idea of building customer loyalty starts with plenty of questions. Is a loyalty program right for your business? Where do you start? What ROI is reasonable to expect? What type of value proposition is most ideal for your customers? With so many questions, Loyalty navigator helps you evaluate the many approaches to loyalty and how each one can or can’t help you achieve your business objectives. 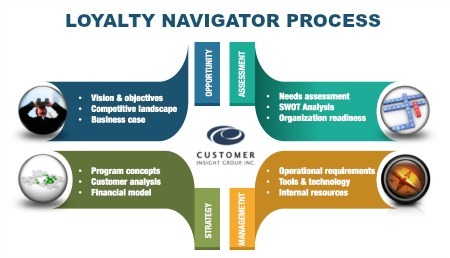 Loyalty navigator is an end-to-end strategic assessment to help you understand the feasibility of a customer loyalty program operationally, within your marketplace and with your customers. Our proprietary Loyalty Navigator assessment encompasses best-in-class loyalty strategy from the inside out — including the organization, process, and loyalty software evaluation. Loyalty navigator guides you to a differentiated loyalty approach focusing on strategy, data and metrics, performance management, people and organization, and if a loyalty program makes sense, program execution. Whether you are just starting to think about a new loyalty strategy or wanting to revamp an existing one, Customer Insight Group’s loyalty navigator will help you determine if your company is ready and if the investment is feasible. How do you know when its time to give your loyalty program a facelift?